RUSH’s Construction Advisory Board: A Continuous Source for Business Improvement – RUSH, Inc. RUSH Construction, Inc. recently returned from meeting with its Construction Advisory Board (CAB) for the 27th time in the past 12 years. A peer group formed outside of RUSH’s board of directors, CAB is designed to continually improve each member’s business practices and operations. This involves members challenging each other to make improvements, and then holding each other accountable to make sure those changes happen. Formed in 2002 with the help of Associated Builders and Contractors (ABC), CAB includes four non-competitive companies in the construction industry: Keller-Martin Construction (San Antonio, TX), TerWisscha Construction (Willmar, Minnesota), Cicero’s Development (Plainfield, IL), Zartman Construction, Inc. (Northumberland, PA) (and RUSH Construction, Inc. (Titusville, FL). The group meets for a few days twice a year, rotating the location each time. During these meetings, items affecting the industry are discussed, and each member raises topics of interest or concern to the group. RUSH encourages businesses in all industries to form a similar peer group, outside of their board of directors.Â For those interested, RUSH recommends contacting the industry’s peer associations, or conducting a search for peer groups or other non-competitor companies in the same industry. 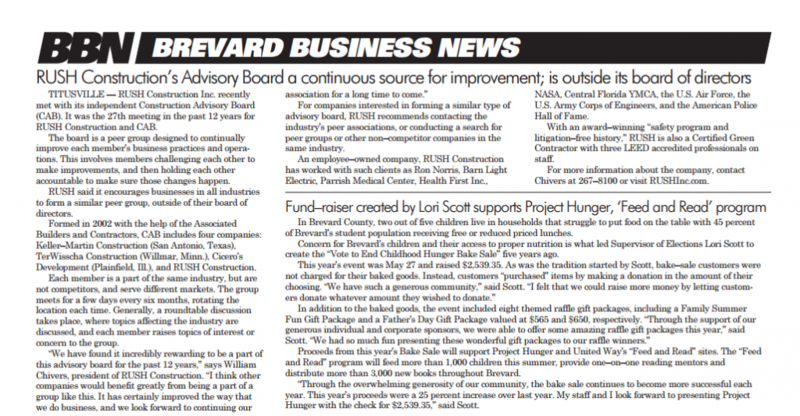 Read more about RUSH Construction, Inc.’s Construction Advisory Board in the June 2014 issue of Brevard Business News.